On April 11, 2015 there were dozens of rallies across Canada demanding true leadership to deal with the climate crisis we face around the world. The federal Harper government continues to be a climate laggard refusing to address the need to reduce our carbon emissions and violate Indigenous peoples rights with its zealous pro-tar sands agenda. For the first time in Quebec, Indigenous peoples led the march to show our resolve to protect the sacredness of Mother Earth and demand justice. As I stood before a crowd of 25 000 people from across Canada, I spoke of the contamination, despair and detrimental impacts my family and many other communities face from resource extraction happening in our homelands of Northern Alberta. Melina finding oil in water from an oil spill in Lubicon traditional territory. Photo: Joe Whittle. All rights reserved. Due to being an Indigenous activist who speaks out against environmental destruction I have been labelled by the Canadian government as an “adversary”. Both “Aboriginals” and “environmentalists” were labelled as such in 2012 when secret government documents were accessed through the Freedom of Information Act. And now the Harper government is taking this to yet another extreme by attempting to pass an anti-terrorism law called Bill C-51. which includes targeting the “anti-petroleum movement” as “extremists” because they oppose “critical infrastructure” projects like the tar sands and tar sands pipelines. This bill is an attempt to silence people who do not agree with the Harper government and can be used to target and criminalize democratic peaceful protest movements. Over 100 legal experts expressed deep concern calling the bill “a dangerous piece of legislation” and addressed an open letter to all members of parliament to amend Bill C-51 or kill it. It is legislation like this that makes it difficult for people to not be scared into silence, and for people like me who believe that we need a just transition to renewable energy and engage in peaceful protests that may be seen as criminal in the eyes of the Canadian government. But this history is not new for us as Indigenous peoples here in Canada. It is the continuation of neo colonialism seen now in the form of resource extraction, environmental and cultural genocide. The traditional territory of my ancestors and my Nation of the Lubicon Cree covers approximately 10,000 square kilometres of low-lying trees, forests, rivers, plains, and wetlands – what we call muskeg – in northern Alberta. For three decades, our territory has undergone massive oil and gas development without the consent of the people and without recognition of our treaty & Indigenous rights, which are protected under Section 35 of the Canadian Constitution. In the 1970s, before this encroachment on the land began, my father's generation and my grandparents’ generation survived by hunting, fishing, and trapping throughout the region. Back then, and even into my own generation, people were still living off the land. I remember going out on the trapline, and I remember when the water was still good to drink. But as oil and gas have come through the territory, that’s changed. Currently there are more than 2,600 oil and gas wells in our traditional territories. Over 1,400 square kilometres of leases have been granted for tar sands development in Lubicon territory, and almost 70 per cent of the remaining land has been leased for future development. Where there once was self-sufficiency, we are seeing increased dependency on social services as families are no longer able to sustain themselves in what was once a healthy environment with clean air, clean water, medicines, berries, and plants from the Boreal. Our way of life is being replaced by industrial landscapes, polluted and drained watersheds, and contaminated air. And it's very much a crisis situation. In the North, we are seeing elevated rates of cancers and respiratory illnesses as a consequence of the toxic gases being released into the air and water. And while over $14 billion in oil and gas revenues have been taken from our traditional territory, our community lives in extreme poverty and still lacks basic medical services and running water. Canada’s treatment of the Lubicon has been repeatedly condemned by the United Nations, and UN Special Rapporteur Miloon Kothari has called for a moratorium on oil and gas in Lubicon territory. On March 26, 1990, the United Nations Human Rights Committee ruled that Canada’s failure to recognize and protect Lubicon land rights violated the International Covenant on Civil and Political Rights. In 2006, the United Nations Human Rights Committee again called on Canada to address outstanding land claims in Lubicon territory before granting further licences for economic exploitation, yet this resource extraction is still happening. In 1899, when Treaty 8 was officially signed in northern Alberta, treaty commissioners overlooked the Lubicon Cree due to their remote and hard-to-reach territory. The Lubicon people therefore never ceded their traditional territory to the Crown. This has led to a precarious and unstable relationship with both the provincial and federal governments as both have continuously undermined the sovereignty of the Lubicon people. For decades the Lubicon have tried to settle these outstanding land disputes, but unfortunately it serves the government’s interests to keep the Lubicon land claim outstanding due to the territory’s rich oil and gas deposits. When the construction of an all-weather road began in the early 1970s, the Lubicon people started to contest the encroachment of their traditional territory as multinational corporations began to exploit the land. For the 14 years that followed, the Lubicon attempted to assert their rights through various court proceedings at both the provincial and federal level. By 1988, the Lubicon concluded that it was necessary to use other means of direct action so their voices and message would be heard. On October 15, 1988, the Lubicon people erected a peaceful blockade, which was successful in stopping oil exploitation of the territory for six days. Only then did Alberta Premier Don Getty meet with the Lubicon chief and agree to a 243-kilometre reserve under the Grimshaw Accord. Despite this agreement, the Canadian government offered the Lubicon substandard conditions in the land settlement agreement. Even Premier Getty described the offer as "deficient in the area of providing economic stability for the future." Unfortunately, due to the take-it-or-leave-it approach of the federal government, the land claim negotiations continued from 1989 until 2003 when the talks broke down completely and both parties walked away from the table. To this day, the Lubicon Cree have been unable to settle a land claim, which has drastically hindered their ability to protect themselves and their traditional territory from further exploitation and destruction. On April 29, 2011, a rupture in the Rainbow Pipeline resulted in a spill of about 4.5 million litres of oil in our territory – one of the biggest oil spills in Alberta's history. When the pipeline broke, oil went down the corridor and into the forest, but the majority of it was soaked up into the muskeg, which is like peatland moss and takes thousands of years to be generated. The muskeg is not an isolated system. It's not "stagnant water," as the government claims. It's actually a living, breathing ecosystem that supports life and is connected to all the water in the region. On the first day of the spill, the school was not notified. When students started to feel sick, they were evacuated from the school under the assumption that it was a propane leak. When they got outside into the field, they realized that the problem was throughout the community. The first week of the spill, community members experienced physical symptoms: their eyes burned, they had headaches, they felt nauseous. We were told that air quality was not a problem, even though Alberta Environment didn't actually come into the community until six days after the spill. This is problematic since the government granting permits for this type of development to happen, often without the consent of the people, has an obligation to take care of those whom they are directly putting at risk. A lot of people were left wondering what they should do, and if pregnant women and small children should even be in the community. The Rainbow Pipeline is now 45 years old. When it broke in 2006 and spilled 1 million litres of oil, the Alberta Energy and Utilities Board stated that stress and corrosion in the pipeline's infrastructure contributed to the spill. Five years later, 4.5 million litres spilled in our traditional territory. We're also seeing pipeline breaks like this in other parts of North America, from Kalamazoo, Michigan, to the Kinder-Morgan spill along the West Coast. Will it ever end? 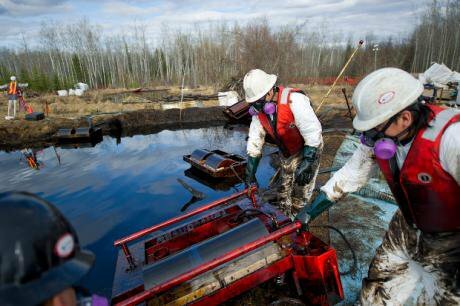 Workers cleaning up the Rainbow pipeline spill in Lubicon territory. Photo: Rogu Collecti / Greenpeace. All rights reserved. For over a century now, the Lubicon Cree’s rights have not been protected or respected. For decades the Lubicon have led local, national, and international lobbying efforts to fight for what is inherently theirs and to protect their right to their land and to clean air and good water. But despite years of raising awareness and increasing exposure, the Lubicon people still wait for justice. Tar sands impacted community members in a walk of prayer for the land. Photo: Keepers of the Athabasca. All rights reserved. However, over the past decade of speaking out and demanding justice I have seen a great shift in how our struggles are perceived. 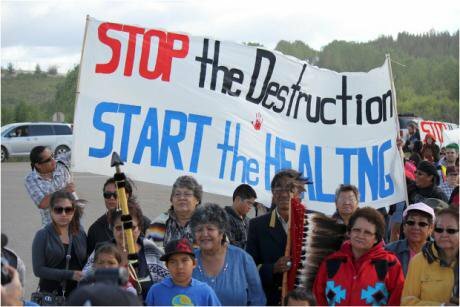 Now people from all walks of life are beginning to stand together and seek justice for those first and foremost impacted on the frontlines of environmental destruction. Now more than ever, people are working together as we know that the fate of humanity is wrapped up in our collective fight for a better, more just world for all. Melina Laboucan-Massimo will be speaking at the Nobel Women’s Initiative conference on the Defence of Women Human Rights Defenders, 24-26 April. 50.50 will be reporting live from the conference. Read more articles by participants and speakers.